I'm 6'2 and 25 years old with a master's in computer science from marshall university. Coding and Gaming are all i do everyday. 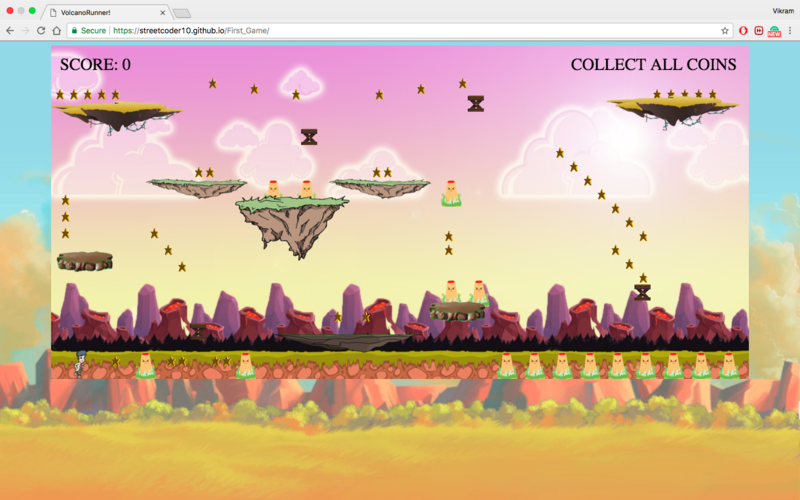 I am currently working for Code4SocialGood app developement team and looking for full-time/contract opportunities. I try to stay an active learner and contribute to the community in what small way i can, dont forget to follow my blog and github accounts. Feel free to get in touch with me through the contact page or through any of the social media links provided. © 2017 Vikram Gopal Media. A simple Web Application that provides facts on the greates football teams in the 20th and early 21st century with real statistics. 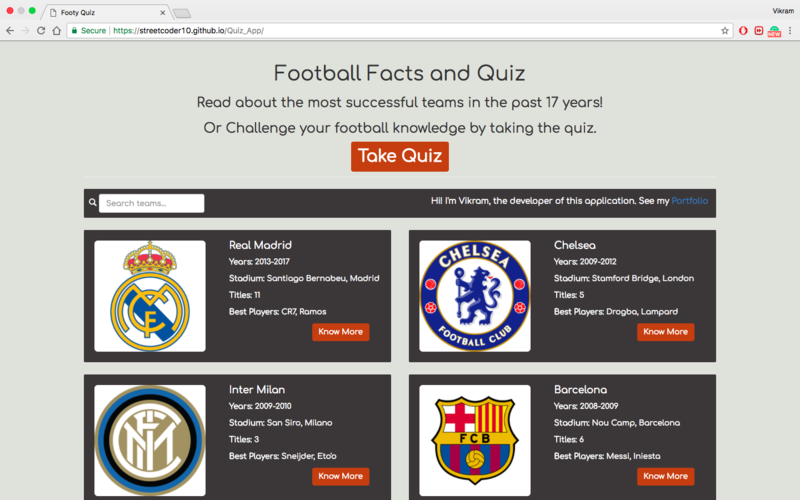 The application hosts a quiz section where one can challege their football knowledge by answering multiple choice questions both through text and images. The application is built using HTML5/CSS3, AngularJS and Bootstrap. The app is powered by GitHub Pages and the project files are available on my GitHub Account. This website was my first responsive website. The web pages are developed using HTML5/CSS3 and Bootstrap. 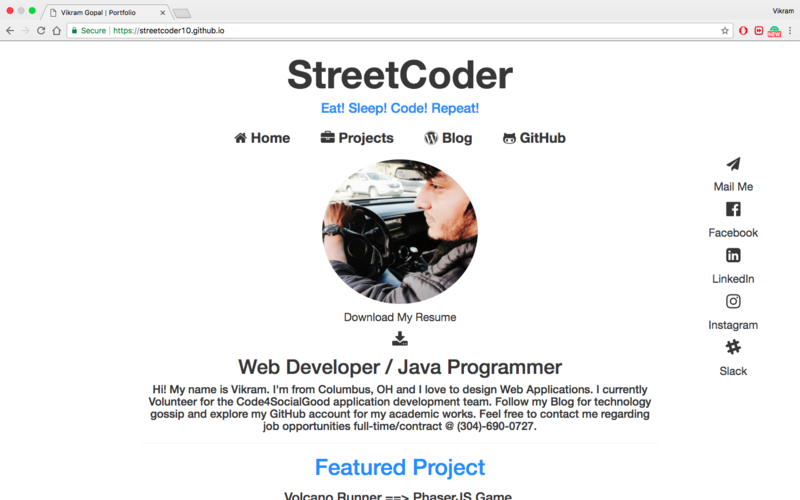 The website has a all the important details of the person on the front page with links to blogs, github etc.. The website also updates the most recently added project as the featured project on the front page. The website has the social icon bar on the left to get in touch with the user. The Projects page is similar to any other portfolio website, It display projects and their details. The website is sutied for all devices. This was my Capstone project for Marshall University Computer Science department. The project was designed and developed by a team of 7 members. The essence of the project is to create a project that can be used by the University to conduct programming contests for High School Students. The contest will be announced on the website. Teachers can register teams of students for their school. Once registered the details of the contest will be provided to the teachers. The teams will be given time to work on their projects for a predetermined period (could be a semester or an academic year). Once the students are satisfied with their results they can acknowledge their respective teachers about completion. The teachers can then submit the project files for review. The submitted files will be assigned to University selected judges for grading and remarks. Once grading has been completed the University will post the leaderboards on the contest website. 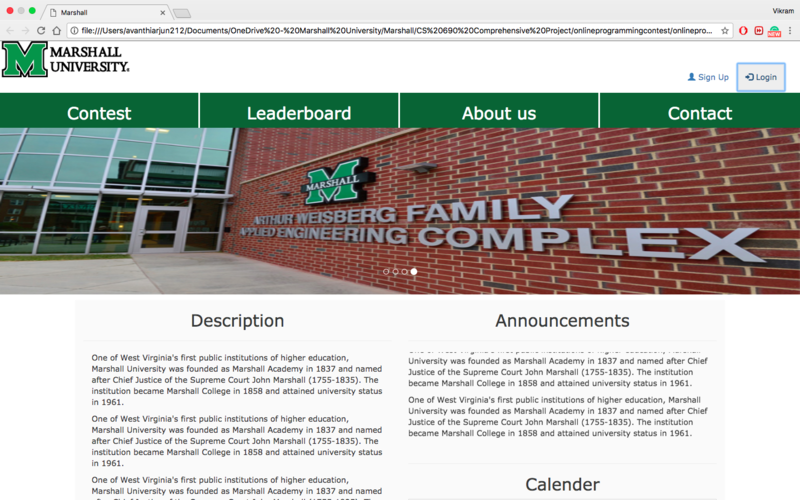 The leaderboard will contain information on how the project was graded and what could be done to improve. The top 3 projects will be recognised by the Univeristy and awarded on campus. 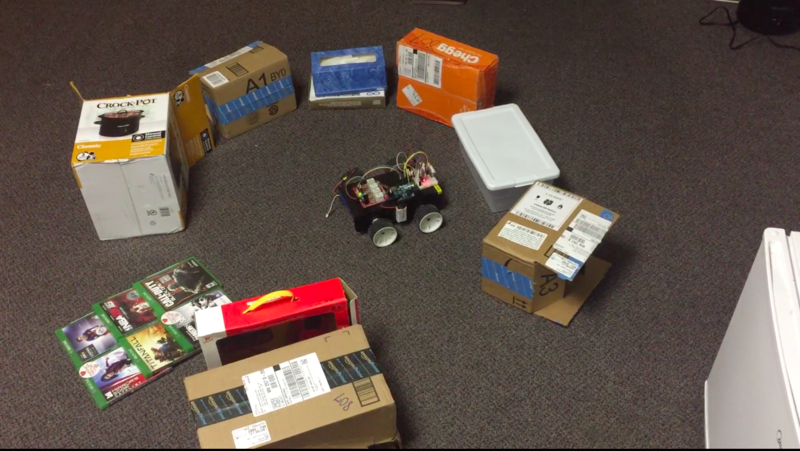 Autonomous Arduino Car Connected to IBM BLuemix. I built my own version of the famous Arduino Car. The car has hardware from Sparkfun technologies. The car has a proximity and IR sensor array for obstacle detection. The car has temperature, humidity, dew, heat, pressure and light detection sensors. The car has a live HD camera that feeds wirelessly to a display. The car has a Wi-Fi shield and Bluetooth module for connectivity. The car is connected to the IBM bluemix cloud for publishing live sensor data in JSON format. 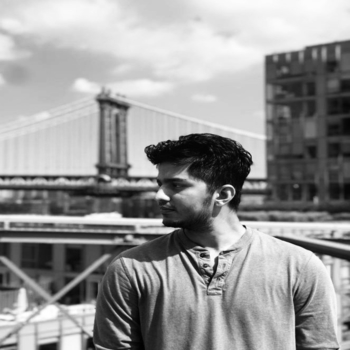 This was achieved with the help of the IBM bluemix quick start recipe which enables any device to get registered to the cloud and publish available data instantly. This project was published and presented at the International Conference for Fuzzy Information and Engineering 2013. Environment – C++, Arduino IDE, SparkFun Car-Build Components and Sensors, IBM QuickStart Recipe. OOPS! 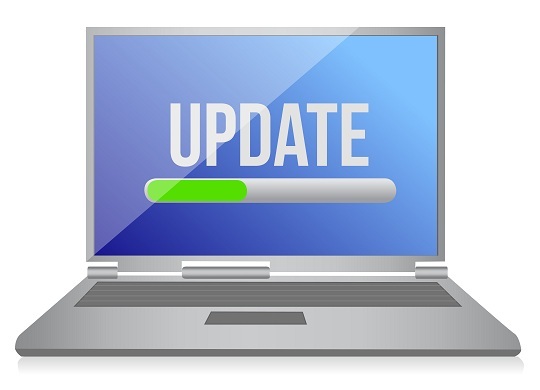 Still updating Projects section Come Back Later.